Taken in Greenwich Village, New York City in May 2007. I wasn’t sure if I wanted to write another 9-11 piece after my last post criticizing the conspiracy theorists standing at the gates, but following the news over the past weekend, I felt a few more words seem justified. With our stop at Ground Zero, we reached the end of our tour of New York City back in October 2007. The pictures, poems, candles and other memorials for those that died certainly threw a dark curtain over our exciting day of touring this city. Leaving our group, my wife (then-girlfriend) and I decided to take the short subway ride to Greenwich Village. One of the more famous hangouts for hipsters and bohemians, the Village was a pretty cool spot. Some neat looking shops, trendy restaurants, and funky bars all gave this neighbourhood a charm of its own. However, this isn’t what stuck with me. Instead, it was a vacant, ugly lot surrounded with a rusty chain-link fence at the corner of 7th and Greenwich avenues. 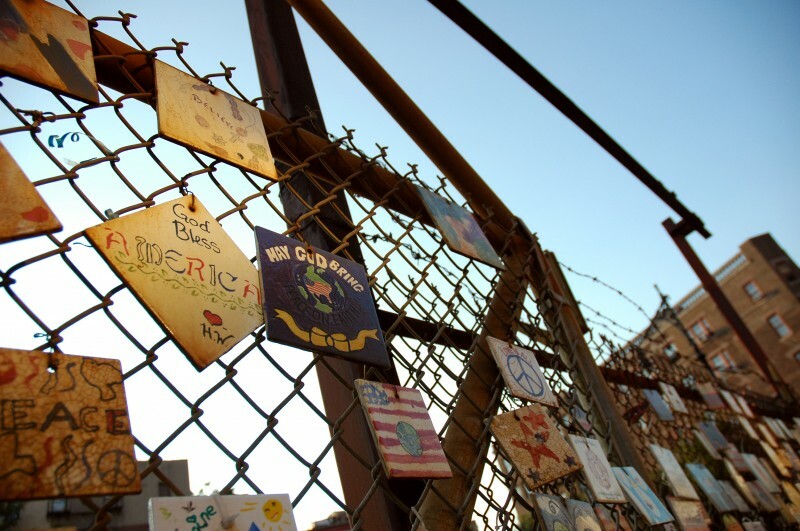 Covering this fence were hundreds, possibly thousands, of brightly painted tiles, all conveying a message of remembrance and peace. Some had pictures of doves. Some American flags. Some just a silhouette of the World Trade Centre. They were sad and mournful, but not bitter. I hope they brought some comfort to whoever it was that painted those tiles. I hope those tiles are still hanging there today. Ultimately, I hope it is their message that endures and not the one that is grabbing too much attention. This entry was posted in Colour, New York and tagged 9/11, Greenwich Village, New York by Darcy Knoll. Bookmark the permalink.